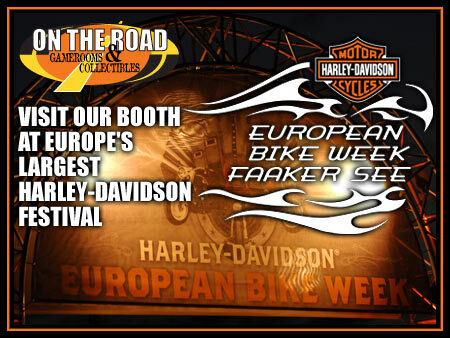 This year we will be back again at Faak am See, to join Europe’s Biggest Motorcycle Festival! On The Road -H-D Roadhouse Collection to be found at their New Location: Now you can find us at the Harley-Davidson®Dealer Mile in the middle of the official Harley® Village! Visit our booth to get one of the new Harley® for your Home products, Inspired by the timeless styling and rich heritage of Harley-Davidson®. These officially licensed lifestyle products have what it takes to get your motor runnin'! So come early as quantities are limited, or place your order online, and pick it up at Faak. No extra shipping costs will be charged! Visit our booth, and get a Free Gift with every 25 euro purchase!